James Raeburn (15-17), a promising young photographer, is pursuing a career in photography and videography. Earlier this year James reached out to the Merchistonian community for support and work experience. 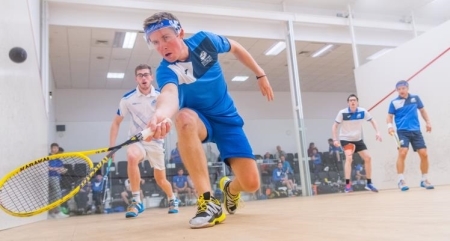 Andy Weston (92-97) of Weston Sports Marketing invited James along to join him at the Scottish Squash Doubles Championships on Sunday 16 July 2017. 'It was a pleasure to work with James at the Scottish Squash Doubles Championships at Scotstoun, Glasgow. I noticed that James was looking for some work experience and I was happy to help out a Merchistonian; I knew it would be a good decision. It was a busy day but he went about his work in a business-like and professional manner. He quickly became acquainted with the players and gained their trust when he was taking pictures of them on and off the court which was important. I am very sure he will be able to forge a successful career in photography and videography and I look forward to working with James in the future. Click here to see James' photo in the Edinburgh Evening News.